Microfluidics is both the science which studies the behaviour of fluids through micro-channels, and the technology of manufacturing microminiaturized devices containing chambers and tunnels through which fluids flow or are confined. 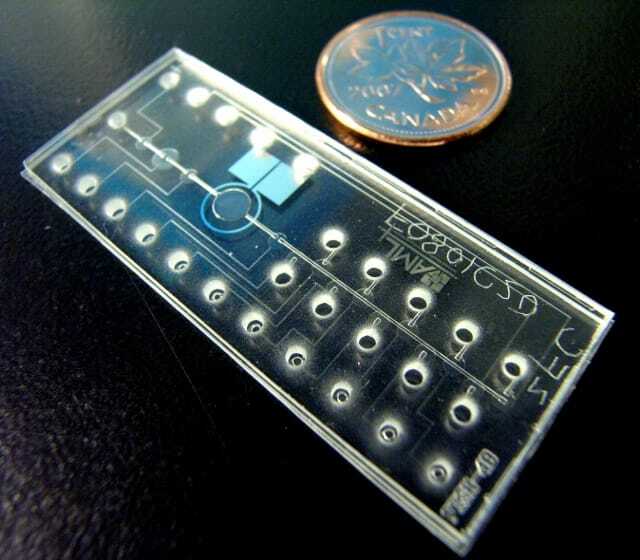 The key concept related to microfluidics is to integrate in a simple micro-sized system operations that commonly sollicits a whole laboratory. A microfluidic chip is a pattern of microchannels, molded or engraved. This network of microchannels incorporated into the microfluidic chip is linked to the macro-environment by several holes of different dimensions hollowed out through the chip. 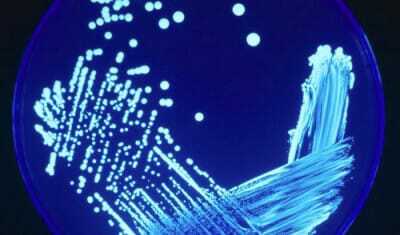 It is through these pathways that fluids are injected into and evacuated from the microfluidic chip. Fluids are directed, mixed, separated or manipulated to attain multiplexing, automation, and high-throughput systems. The microchannels network design must be precisely elaborated to achieve the desired features (lab-on-a-chip, detection of pathogens, electrophoresis, DNA analysis etc.). To accurately manage fluids inside the microchannels, specific systems are required. These elements can either be found embedded inside the microfluidic chip, such as Quake valves, or outside of it, like in the case of pressure controllers. Microfluidic devices exploit the physical and chemical properties of liquids and gases at the microscale. Microfluidic devices offer several benefits over conventionally sized systems. Microfluidics allows the analysis and use of less volume of samples, chemicals and reagents reducing the global fees of applications. Many operations can be executed at the same time thanks to their compact size, shortening the time of experiment. They also offer an excellent data quality and substantial parameter control which allows process automation while preserving the performances. 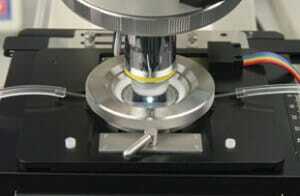 They have the capacity to both process and analyze samples with minor sample handling. The microfluidic chip is elaborated so that the incorporated automation allows the user to generate multi-step reactions requiring a low level of expertise and a lot of functionalities. The microsystems execute functions that extend from detecting toxins to analyzing DNA sequences or creating inkjet printing devices. To learn more about microfluidics applications, visit our dedicated review here. 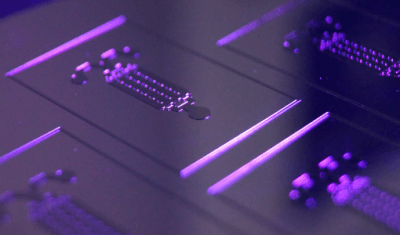 Microfluidics have diverse assets: faster reaction time, enhanced analytical sensitivity, enhanced temperature control, portability, easier automation and parallelization, integration of lab routines in one device (lab-on-a-chip). It is cheap as it does not involve the use of various costly equipment or apparatuses. To have a look at the varied technologies in the field, you can check out the only distributor specialized in microfluidics, Darwin Microfluidics. Need advice for your experiment in microfluidics? A lab-on-a-chip (LOC) is a device performing on a miniaturized scale one or several analyses commonly carried out in a laboratory. It integrates and automates multiple high-resolution laboratory techniques such as synthesis and analysis of chemicals or fluid testing into a system that fits on a chip. There are many advantages to operating at this scale. Samples analysis can occur on location, where the samples are generated, rather than being carried to an extensive laboratory facility. 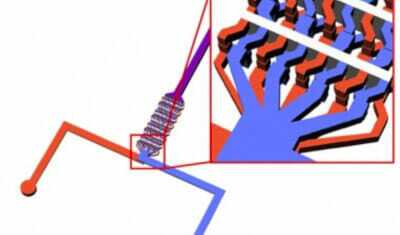 Fluids behaviour at this scale make it easier to control the movement and interaction of samples, causing reactions to be much more potent, and minimizing chemical waste. It also allows reduces exposure to dangerous chemicals. Lab-on-a-chip devices are a subdivision of Micro-electro-mechanical systems (MEMS) devices and often indicated by “Micro Total Analysis Systems” (µTAS). MEMS are information sensors that relay information to a microcontroller that performs the analysis. 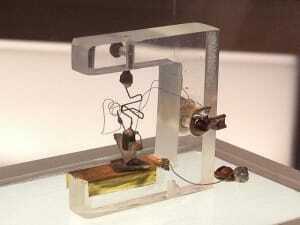 These mechanical miniaturized systems are composed of some substrates (silicon, glass etc.). They integrate various areas of technology. 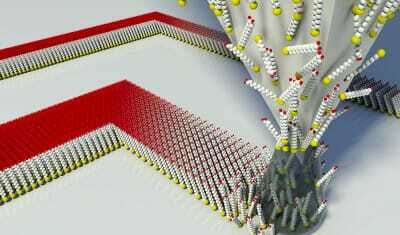 The one which engenders the whole concept is nanofluidics. Nanofluidics examines the behaviour, manipulation, and control of fluids that are circumscribed to structures of nanometric (10-9 m) dimensions. Nanosensors are a primary component of many lab-on-a-chip systems. Sensors have been elaborated using nanomaterials such as carbon nanotubes, suited to apprehend very low volumes like a single cell sample or even smaller samples. 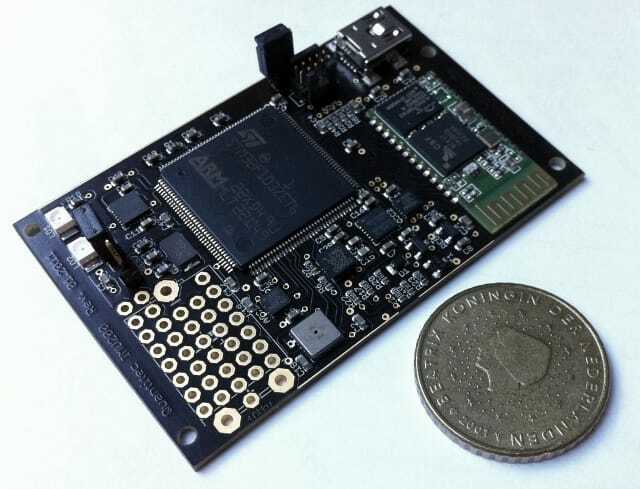 These are highly advantageous since they allow a high degree of analytical flexibility in a lab-on-a-chip system while keeping the small size of the device. Organs on chips are 3D cell culture microdevices aiming to reproduce the key functions of living organs on a computer chip. These microfluidic devices are more efficient than conventional cell culture techniques since they are able to mimic microenvironments as well as their influence on organs functions. This allows to research the human physiology for a specific organ and initiate advancements in artificial disease models. Organs on chips use microfluidics and microfabrication technologies to better replicate the functionalities of living organs. Among them we can find models like gut on a chip, heart on a chip, liver on a chip, lung on a chip, tumor on a chip, muscle on a chip, multiple organs on a chip etc. Microfluidics is an integrative domain originating from a mix of microanalysis, biodefence and microelectronics down to the micrometric and sub-micrometric scale. The history of microfluidics started in the 1950’s, with the invention of the first transistor and the apparition of microtechnology. The inkjet printhead technology in which tiny tubes transport the ink for printing was also invented during this period. In the 60’s computers were miniaturized in order to allow space exploration. 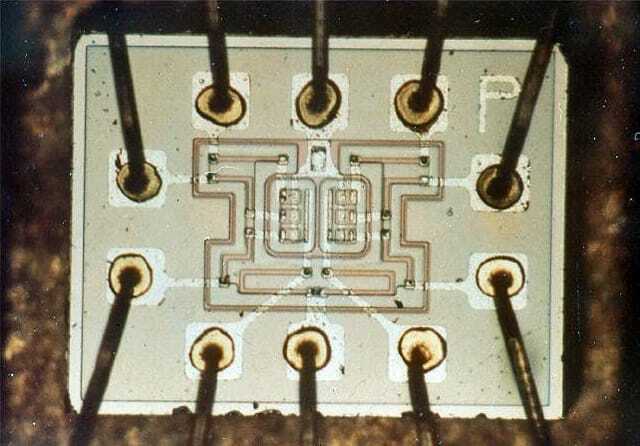 The first integrated circuits and microprocessors were created. Technologies like photolithography were developed and allowed to miniaturize and integrate thousands of transistors on semiconductor wafers. These technologies were then used in pressure sensor production. In 1979 was created the first miniaturized gas chromatograph containing mechanical micro-elements integrated on a silicon wafer, thanks to the use of silicon etching procedures developed for the microelectronics industry. Over the 80s, a new sort of devices called Micro Electro Mechanical Systems (MEMS) emerged, allowing industrial applications such as pressure sensors and printheads. By the end of the 1980s the first microvalves and micro-pumps based on silicon micro-machining were manufactured. 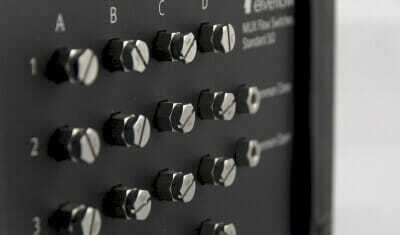 During the following years, several silicon-based analysis systems were developed. At this time microfluidic devices were still made of silicon or glass substrates and required heavy industry facilities and hefty skills. In the 90s researchers spent a lot of time investigating the applications of MEMS in biology, chemistry and biomedical fields in order to allow the control of liquids in microchannels. They developed microfluidic fluid handling devices for integrated analysis systems such as micropumps, thermic flow sensors and massic flow sensors and mechanisms for fluid transport, metering, mixing and others. In the middle 1990s, MEMS technologies implemented tools for genomics research. The military, especially the Defence Advanced Research Projects Agency (DARPA) supported research due to their interest in portable biological and chemical warfare agent detection systems. A leading research area was launched around the elaboration of concepts that could transform the sensor function in a full laboratory analysis on a single microfluidic chip. In the late 90s, the use of soft-lithography allowed the production of cheap microfluidic devices by using moldings of polymer. 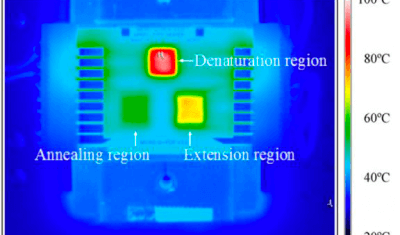 In the early 2000s, technologies based on molding micro-channels in polymers like PDMS encountered a great expansion. 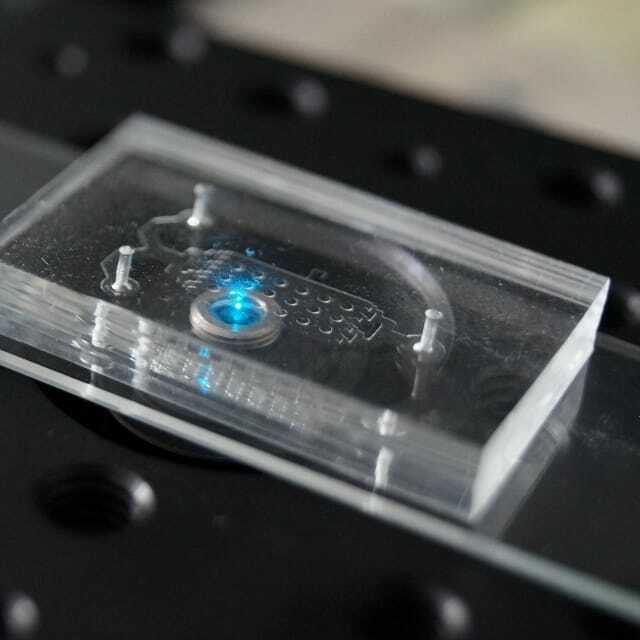 A large number of laboratories were able to conduct microfluidic research thanks to the reduction of costs and production time of these devices. Nowadays, a lot of micro-pumps, mixers, microvalves and other devices are available and employed in microfluidic applications. A continuous flow is a constant, regular, continued flow. Continuous flow microfluidics allow to manipulate the continuous flow of liquid through microchannels thanks to devices such as external pressure pumps or integrated mechanical micropumps. Continuous flow processes are used in a wide range of applications like in bioanalytical, chemical, energy and environmental fields. Also called droplet microfluidics or emulsion science, digital microfluidics is one of the main application fields of microfluidics. 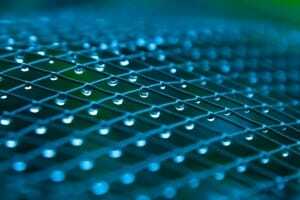 It enables to manipulate autonomous droplets on a substrate using electro-wetting. 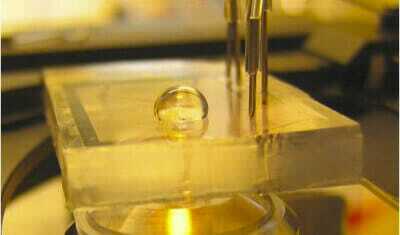 This allows to generate and control uniform, reproducible droplets over the experiments’ parameters. Droplets generation can be used in a large range of applications like in synthesis of nanoparticles, single cell analysis, and encapsulation of biological entities. This technology will probably become an important tool for drug delivery and biosensing, by providing new solutions for state-of-the-art diagnostics and therapeutics. Optfluidics is an emerging fast-growing science resulting from the combination of three fields of science: microphotonics, optics and microfluidics. Microphotonics or the micron-scale control of light, implicates the ordered transport of photons commonly emanating from a laser. Optics is the study of the behaviour and characteristics of light at large scale including its interactions with other elements and the fabrication of devices that utilize or detect it. Optofluidics merges light and liquids into miniaturized optical devices that take advantage of the properties of fluids to generate high precision and flexibility. Optofluidic applications include lab-on-chip devices, fluid waveguides, deformable lenses, microdroplets lasers, displays, biosensors, optical switches or molecular imaging tools and energy. Acoustofluidics deal with the use of acoustic fields, mainly ultrasonics onto fluids within microfluidic channels allowing to manipulate cells and particles. 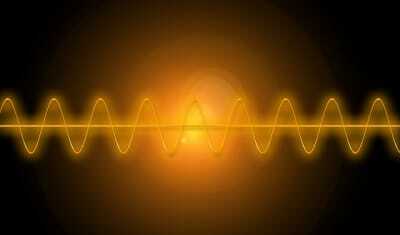 It refers to the study and manipulation of acoustic waves on microscale to nanoscale fluidic environments. 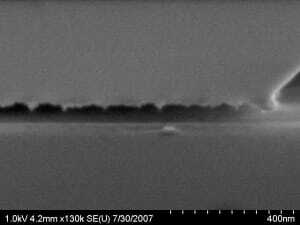 These mechanical waves are inflicted on the fluid through the excitation of the microchannels walls with an actuator. Acoustics offer promising abilities in the manipulation of both fluids and particles within those fluids on the micro / nano- meter scale. This has proven to be a method that is gentle to the cells and that can be employed in many applications such as biomedical applications: lab-on-a-chip functionalization, moving of particles, separation of cells, acoustic trapping. 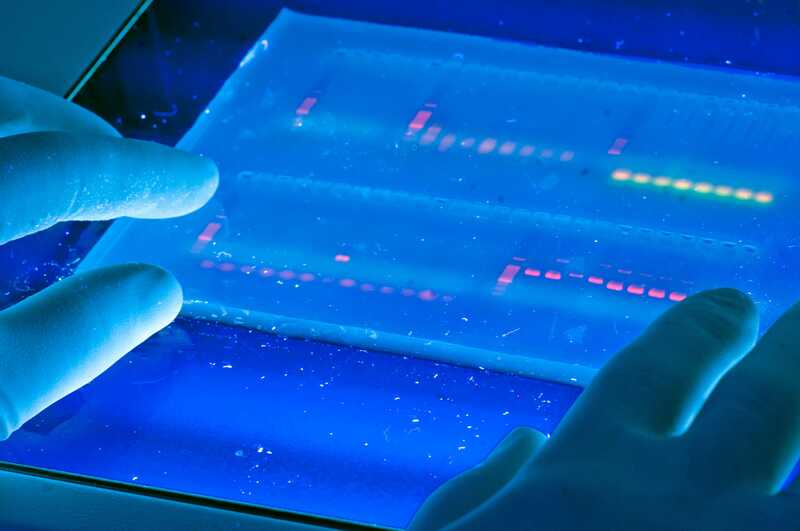 Electrophoresis is a technique used in clinical and research laboratories in order to separate molecules based on their size, electrical charge and shape. 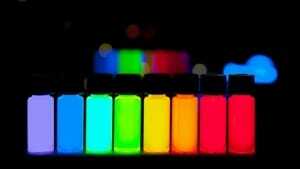 Electrophoresis rests on the movement of ions in an electric field. An electric current flows through a medium holding the mixture of molecules. Positively-charged ions (cations) proceed towards a negative electrode whereas negatively-charged ions (anions) proceed towards a positive electrode. Ions have distinctive migration rates and they can be separated. Electrophoresis of positively-charged ions is called cataphoresis, while electrophoresis of negatively-charged particles is called anaphoresis. This method is used for both DNA and RNA analysis. Microfabrication techniques allow to study and manufacture micro structures down to the micrometer scale and smaller, integrated into microfluidic devices. It is used in a wide range of applications such as replica molding or microcontact printing and notably allows to precisely control cells shape and functions by creating adapted microstructures. Microelectronics deals with the engineering of miniature electronic components and designs. It allows to precisely manufacture micro-sized structures with techniques such as photolithography, etching and bonding. Even though the integration of electrical components is sometimes challenging, it can serve for various applications such as medical sensing systems, and ergonomic units. Electrochemistry studies the relationship between electrical current flows and chemical reactions. Electrochemical detection elements can be integrated within a microfluidic device making it reliable and highly sensitive. Electrochemistry has many applications particularly in analytical chemistry with the development of electrochemical sensors, lab-on-a-chip and biosensors. Elveflow® offers tutorials and reviews on topics related to microfluidics. The aim of this section is to provide information to beginners and confirmed researchers in microfluidics to help them easily explore this field. Early microsystems used silicon microfabrication, leading to complex and expensive processes such as chemical etching. Materials like glass and silicon require a lot of time, effort and money. 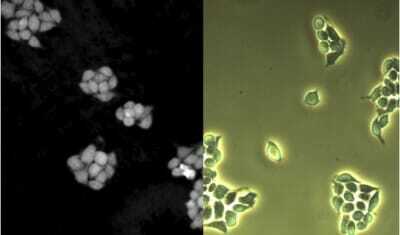 To overcome these problems, microfluidic chips in polymers have been introduced. It is the experiment and the budget that will determine the choice of the best suited material since all of them have pros and cons. More and more, paper microfluidic chips are examined as a possible key technology for the future. 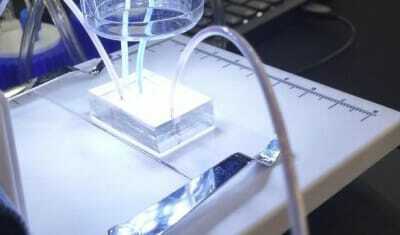 For some applications, several materials will be associated to conceive the adapted microfluidic chip. Silicon was among the first materials elected in the fabrication of microfluidics devices. 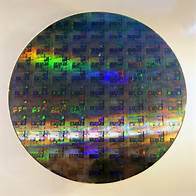 Today silicon is less employed due to its high cost and its opacity that makes optical detection unreachable, except for IR. In addition, it requires real expertise in microfabrication and a clean room. Nevertheless, it allows to achieve high precision silicon machining. Silicons have good surface stability, chemical compatibility and electrical conductivity which allows to integrate electronics on the microfluidic chip but makes it impossible to use for lab-on-a-chip applications demanding a high voltage, like electrophoresis. 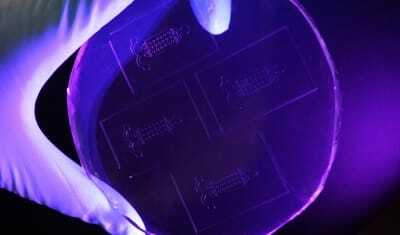 Glass is another material early used in microfluidic chip manufacturing. It benefits from the same surface stability, thermal conductivity, and solvent compatibility properties of silicon. Moreover, glass is biocompatible, chemically inert, hydrophilic and allows efficient coatings. Its surface chemistry, superior optical transparency and high-pressure resistance make it the best choice for many applications. The main drawback of glass in microfluidic chips is its high cost. Polymers are broadly used in the manufacturing of microfluidic devices because they are robust, inexpensive while conserving strong bio-chemical performances. Polymers have found useful applications in microfluidic devices because of the large range of polymeric materials and the facility of chemical modification. 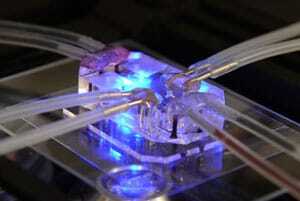 Polymers can be used to rapidly fabricate microfluidic devices. We can divide them into two categories: thermoplastics and thermosets. Some of the thermoplastic polymers that can be used in the fabrication of microfluidic chips are Polystyrene (PS), Polyether Ether Ketone (PEEK) polyethylene terephthalate (PET), polyvinyl chloride (PVC), polymethylmethacrylate (PMMA), cyclic olefin copolymer (COC), polycarbonate (PC), PEI (Polyetherimide) and polydimethylsiloxane (PDMS). 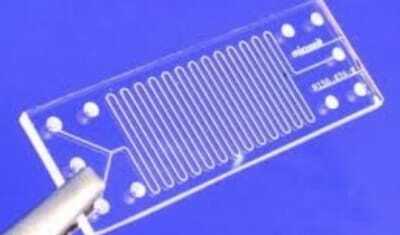 Among them, PDMS (Polydimethylsiloxane) which allows a rapid and effortless microfluidic chip fabrication is widely used. PDMS has several advantages such as its optical transparency, its elasticity, its low toxicity, its chemical inertness, its low cost and its rich gas permeability. PDMS can also be manipulated easily and doing PDMS devices can require only little equipment. These properties make it particularly adapted for the fabrication of microdevices for cell or tissue culture. But PDMS is limited by the aging of the material and the poor chemical compatibility with many organic solvents. In addition, PDMS absorbs small molecules on its surface and water vapor that can unintentionally occur during the experiment. Furthermore it is not possible to implement electrodes within the microfluidic chip, unless by installing those in the glass cover slide instead of the chip. What’s more, PDMS chips are inappropriate for high pressure operations since it can modify the microchannels geometry. Thermosets are polymers that are tied together by chemical bonds that are not reversible during the curing process. They are optically transparent, inexpensive, easy and fast to craft. 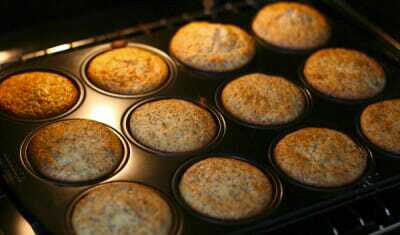 They don’t melt, don’t swell with certain solvents, they are insoluble and highly resistant to creep. Thermosets highly cross-linked polymeric structures explain their high mechanical and physical strength and yet poor elasticity in comparison with thermosetting plastics and elastomers. Besides, when heated they become hard materials and as such, they need fluidic interconnectors. Additionally, thermosets are not gas permeable which makes them a poor material for long-term applications based on cells. One of the most used thermosets in microfluidics is thermoset polyester (TPE) but others can be found, such as Epoxy resin. Unlike thermosets, thermosetting polymers can be shaped, softened and melted over and over again when heated. The intermolecular bonds in a solid thermosetting polymer can temporarily break when applying heat and pressure. This way, the molecules can flow into new positions. Right after cooling, the molecules harden in their new positions, reconstructing the secondary bonds between them and producing a new solid shape. The curing process is infinitely reproducible since no chemical bonding occurs. 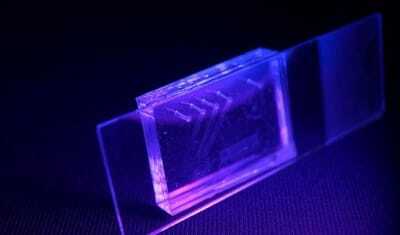 Paper is an extremely cheap and promising material for microfluidic chips. Indeed paper is slender, easy to stock, employ and transport. It is compatible with biological samples and can be chemically treated to bond with molecules or proteins. 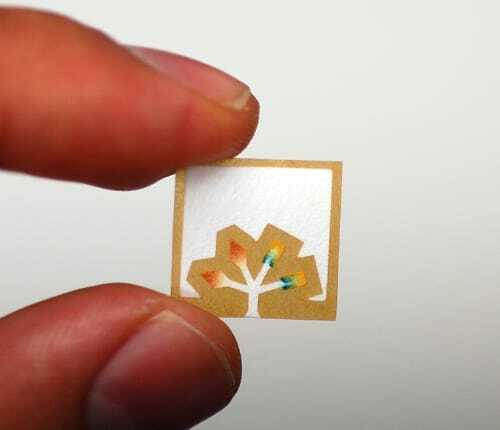 Finally, paper for microfluidic chips is excessively environmentally friendly. 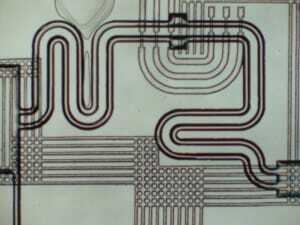 The main drawback in using paper-based microfluidic devices is that it is very complex to pattern the channels on the chip. 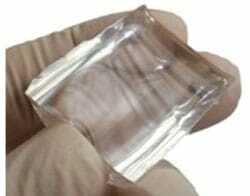 Hydrogel is very supple, and various feature designs and sizes can be molded onto it. Hydrogel is non-toxic to the cells, cost-effective and commercially accessible. Most cell nutrients and growth factors are diffusible in hydrogel. The diffusivity of most solutes in agarose gels, a common hydrogel used for microfluidic chips, is recognized to be very close to that in water. Various techniques can be employed to fabricate devices for microfluidics. For example, it is possible to use photolithography, soft lithography, thermoforming or etching techniques. To determine which fabrication method is the best suited, it is important to take into account the choice of the material substrate, the equipment available, the cost and time of manufacturing, the technologies involved as well as the desired functions to integrate. The wafer has to be cleaned to remove any residue. A barrier layer is applied onto the wafer. 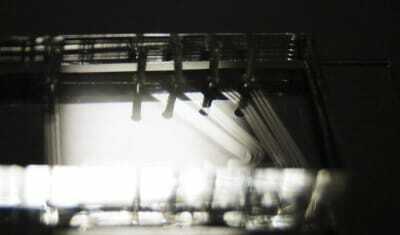 The substrate is coated with a photoresist at high speed by spinning. This step allows to define the thickness of the layer. During this step, all solvents are to be removed from the photoresist coating by evaporating thanks to moderate heat. 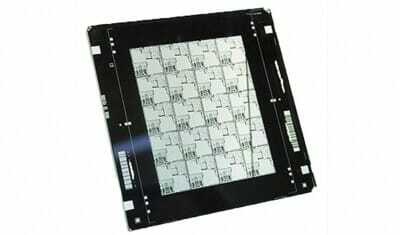 Individual areas of the photoresist are selectively exposed to optical or UV light through a photomask. This exposure induces a chemical reorganization in the photoresist. Exposure to UV light modifies the chemical structure of the photoresist to make it more soluble in the developer. Negative resists behave in reverse. Exposure to UV light leads the negative resist to become polymerized, and harder to dissolve. As a result, the negative resist is left on the surface of the wafer in everywhere it had been exposed. The substrate is immersed in a developer solution that will disintegrate areas of the photoresist that were exposed to light. As a result, the photoresist is patterned with the exact master image that was provided by the user. The developer solution dissolves only the unexposed parts of the photoresist. The mask employed for negative photoresists then holds the inverted reproduction of the pattern to be transferred on the wafer. The substrate is baked in an oven or hot plate to eliminate liquids that may have been absorbed on the substrate and to create covalent bonds within the remaining photoresist increasing mechanical and chemical stability of the material. In microfluidics, soft lithography is a diverse set of techniques that use a soft elastomer material (most of the time PDMS) to transfer patterns to a substrate material. The basic process consists in building elastomeric microchannels. These microchannels are designed in a specific program and then printed onto a high-resolution transparency mask or remodeled into a conventional chrome mask to produce a master which will serve as a mold for the soft material. Soft lithography presents various advantages over other forms of lithography, among which we can find its low cost and easy fabrication process; its rapidity, its tolerance over a wide variety of materials. In addition, soft lithography allows to create precisely delimited and manageable surface chemistries. It is also compatible with numerous applications that include cell biology, microfluidics, lab-on-a-chip or MEMS. Soft lithography can be divided into 3 different major subcategories which are replica molding, microcontact printing and embossing. Replica molding in microfluidics allow to transfer a pattern from a rigid or elastomeric mold called a master into another material by way of a liquid polymeric mixture which starts to solidify when it gets in contact with the master. A microscale pattern is generated with computer-assisted design software before being transferred on a photomask. A thin uniform film called photoresist is spin-coated on a silicon wafer, which is then covered with the photomask. Liquid polymeric mixture is poured onto silicon master before being baked or exposed to UV light. Thanks to heat, the replica solidifies, leaving the microscale pattern etched into the photoresist. The desired features it is then peeled away from the master mold and sealed. Replica molding can be repeated multiple times and enables to pattern a wide range of materials. Microtransfer molding (µTM) is a technique for microfluidics in which a patterning substance is used to fill a polymer stamp, usually in PDMS, which is then pressed against a substrate. 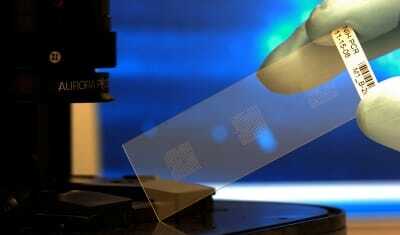 These elements are cured and the stamp is taken away, leaving the microfluidic chip patterned. An elastomeric mold is used as a master in which is poured a polymeric liquid such as polyurethane (PU) or thermally curable epoxy. The polymer surplus is first removed from the master. The polymeric liquid is then inverted and brought into contact with a solid substrate before being cured. Once cured, some excess polymer will remain between the features on the substrate that needs to be cautiously peeled away. In order to uncover this polymer film, also called “scum”, it is possible to use reactive ion etching techniques. Microtransfer molding allow to create three-dimensional structures and to pattern both planar and curved substrates. Repeating the process authorize to generate multilayer structures. 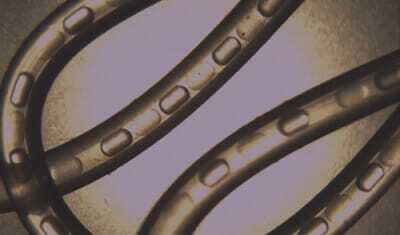 In micromolding in capillaries (MIMIC), a patterned PDMS is used as a mold to form continuous channels. Micromolding in capillaries is a three-step process very similar to microtransfer molding, except that the elastomeric PDMS master has a microchannel structure. A PDMS stamp is first put into contact on a substrate, the relief pattern facing towards the substrate. Polymeric liquid is applied at the end of the channels. The capillary forces draw the liquid into the channels, allowing the liquid to progressively fill the patterns of the PDMS mold. The material is then cured in the shape of the PDMS mold, either by UV, heat or chemically by using a curing agent. Once the curing process is complete, the PDMS master is gently removed, leaving solid microstructures patterned on the surface of the substrate. In micromolding in capillaries, no scum is generated. 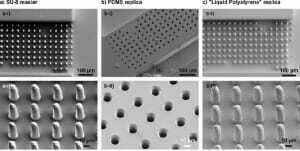 MIMIC is used in microfluidics to fabricate really sharp structures, with features down to 1 µm in size. Hot embossing is a method employed to pattern thermoplastic materials against a master (stamp) by using pressure and heat. Indeed, thermoplastics can be remodeled when heated near the glass transition temperature (Tg). 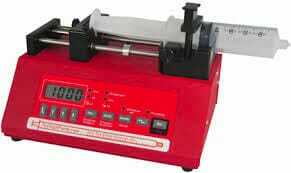 After being conceived, the stamp and the chosen polymer substrate are put into a hydraulic press, and then heated above the glass transition temperature of the polymeric stamp to make it deformable. Next, the master mold is pressed into polymer substrate with precisely controlled force to emboss the plastic against the stamp and pattern of the mold replicates on substrate. When the predetermined embossing time is over, the system cools down to just below the glass-transition temperature of the polymer which sets the pattern. Then deembossing occurs when the master mold is separated from the substrate. Hot embossing is a fast and inexpensive technique for microfluidics, but it requires specific press equipment and a patterned stamp. Embossing can be achieved without heat as well, by applying extended pressure. It then will be called room-temperature imprinting method. A variant form of hot embossing is hot roll embossing. The technique is the same except that two rolls are employed to apply pressure. With this method it is important to take into account the speed parameter. Hot roll embossing is rather employed for mass production. Injection molding in microfluidics refers to a replicating process in which a material is heated up to its melting temperature and injected under high pressure into a mold cavity. A component is turned into liquid by being heated inside a barrel. It is then blended and speedily injected into a clear-cut mold cavity under high pressure. The micro-mold must be maintained at a temperature above the material’s melting point, until the end of the filling process, to ensure a complete fill of the mold. The material is cooled below its Tg and hardens, adopting the shape of the cavity. The finished device is then ejected. Because of the cost and intricacy of the molding apparatus and fabrication of the masters, injection molding is mainly used in industry. This process allows for a high throughput fabrication with a substantial capacity of production. It also allows to create high quality patterns, and structures with different depths. However, injection molding is rather adapted for medium or large size chip production. Photoablation for microfluidics allows to shape microfluidic channels by eliminating material from a thin layer of thermoplastic substrate with a forceful pulsed laser light. In photoablation, tiny volumes of material absorb a pinnacle of laser energy. This assimilation initiates tough electronic transitions that induce a shock wave in the substrate which engenders bond breaking in the polymer chain. The decomposed molecular fragments then expand in a plasma plume that clear thermal energy away from the workpiece forming a precise photoablated cavity. The depth and width of the channels are determined by the laser energy and by the repetition frequency of the pulse applied along the same channel. Photoablation can be performed by exposing the substrate with a mask delineating the zone to be ablated, or by using a direct-write without mask. Photoablation can be used with almost any material. It allow to produce very sharp features and creative patterns in a short time even though they can sometimes be hard to reproduce. However particles residues can be hard to remove, causing contamination and lack of reliability of the final device. Hence, photoablation cannot be exercised in any type of environment. Besides, the cost of ownership of the device can substantially vary depending on the type of laser used and the choice of the photoablating technique. Another drawback is that photoablation produces rather large channels and low resolution. Micro-milling is a micromachining process involving the mechanical carving of a substrate material by inserting a workpiece in a rotating drum with multiple cutting teeth. In microfluidics, micro-milling is the removal of material thanks to adapted cutting tools. It utilizes a drum with lots of very tightly spaced teeth. While the drum turns, the teeth are brought into contact with the substrate in order to remove excess material. The sharp tool induces breakage in the material along established paths enabling to remove the unnecessary part of the material. The smoothness of the micro-milled substrate depends on various parameters including the spindle speed, the cut of depth, the feed rate as well as the operating environment. It is important to carefully apply force onto the substrate to control the removal of material especially in the particulate level. Micro-milling has a lot of advantages, such as low cost, flexibility, fast fabrication or the ability to fabricate complicated structures. 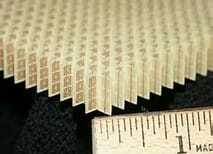 Processed surfaces can be micro-milled to any desired shape. One of the most attractive facet of micro-milling is the possibility to design 3D features characterized by high aspect ratios and high geometric complexity. Besides, this technology is adapted for both serial and small quantity production. In microfluidics, etching is the process in which layers are selectively removed from the surface of a wafer by the means of chemicals. Etching is commonly used with silicon or glass substrates. The etching consists in shielding some part of a substrate and eliminating the other to remove a particular amount of material. Usually, a photoresist is used to safeguard the parts resisting etching by photolithography techniques. In other cases, a more durable mask such as silicon nitride suits better. Many etching steps are necessary before total completion of the wafer. Traditional ways to pattern silicon or glass microfluidic chips used etching procedures, but those techniques require a strong background and a clean room which are not easily accessible to small microfluidic labs. 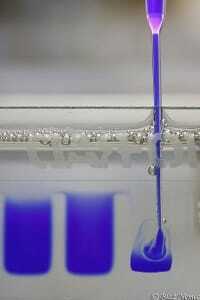 Wet etching in microfluidics is the removal of a material by using appropriate liquid chemicals or etchants. The substrate is immersed into a corrosive solution for itself. Patterned masks are used to secure the areas that are not to be taken off. Material that is not protected by a mask is removed by the wet etchant. The wet etch process holds three steps. In the first place, the liquid etchant is diffused on the surface that is to be removed. The substrate can be immersed in a bath of etchant, which is then shaken to attain fine process control. Next, a reaction occurs between the chemical etchant and the material being etched away, commonly a reduction-oxidation reaction. Once the etching is complete, the substrate is rinsed to clear away any residual etchant which might otherwise pursue etching or become a contaminant. Since a mask is usually employed to selectively etch the substrate, it is important that the mask doesn’t dissolve or at least etches much slower than the substrate to be patterned. In addition, some materials such as silicon, present different etch rates in different directions in the material with certain chemicals. This is called anisotropic etching. Wet etching tends to be simpler and less accurate than dry etching. The dry etching process in microfluidics, also referred to as plasma etching, is the removal of a substrate material by using plasmas or etchant gases. Dry etching is performed by ionizing a gas mixture inside a chamber to get ions that will then react with the target substrate. Dry etching techniques are widely use to transfer patterns into a substrate with high precision. Compared to wet etching this technology is expensive. The ablation reaction can occur by three different ways: by chemical reaction (using reactive plasma or gases), by physical removal (generally by momentum transfer), and by the use of both of these latter. Physical dry etching in microfluidics employs high kinetic energy obtained from a beam of ion, electron or photon to etch off the substrate atoms. No chemical reaction occurs. When the high energy particles hit the atoms from the substrate surface, the material evaporates. Only the unmasked material will be removed. In chemical dry etching (also known as vapor phase etching), the gas molecule reacts with the surface of the substrate material and removes the atoms from it. This process comprises a chemical reaction between etchant gases to attack the substrate surface. The chemical dry etching process is usually isotropic and exhibits high selectively. Due to the directional nature of dry etching, undercutting can be avoided. Reactive Ion Etching (RIE) in microfluidics combines physical and chemical etching to reach high levels of resolution. The process is the most diverse and most widely used dry etching process since it is faster than the others. In reactive ion etching, the substrate is put in a reactor in which a combination of gases are added. The high energy impact resulting from the ionization supports the separation of the etchant molecules into more reactive species. 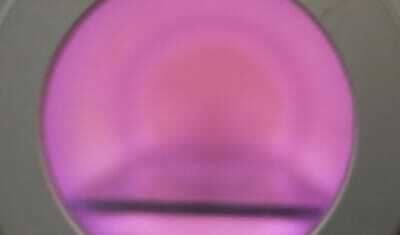 A plasma is inserted into the gas mix, turning the gas molecules into ions. 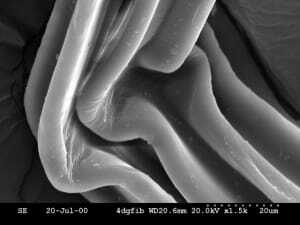 These ions, reacting at the surface of the material being etched, form another gaseous material. 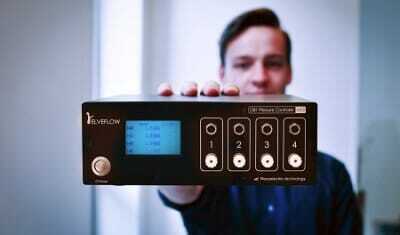 Elveflow® proposes tutorials and reviews on topics related to microfluidics. The aim of this section is to provide information to beginners and confirmed researchers in microfluidics to help them to easily explore this field.